Idle valve Idea for JRSC m45 kits - Miata Turbo Forum - Boost cars, acquire cats. When i look at my data logs, the Duty cycle of the idle valve is "twitching" from open to close in idle. Really not 100% if this is the soul reason why, but it could be possibly or at least contributing to it. Did this work / help with idle droop? I never had a chance to try it. But...i posted the same thread on miata.net and found that this would only slightly help the iac valve recover, compared to just doing a dual throttle set-up. The reason the iac fails at hard deccel with an m45 is because the valve opens back up while there is still boost, which throws it off. zack. I just picked up an m45 sc kit for a 96 miata. It seems complete except it is missing the IAC Check valve and the short hose end. Any idea how I locate these missing items? an MS3 with a few minutes tuning the idle control would work better. 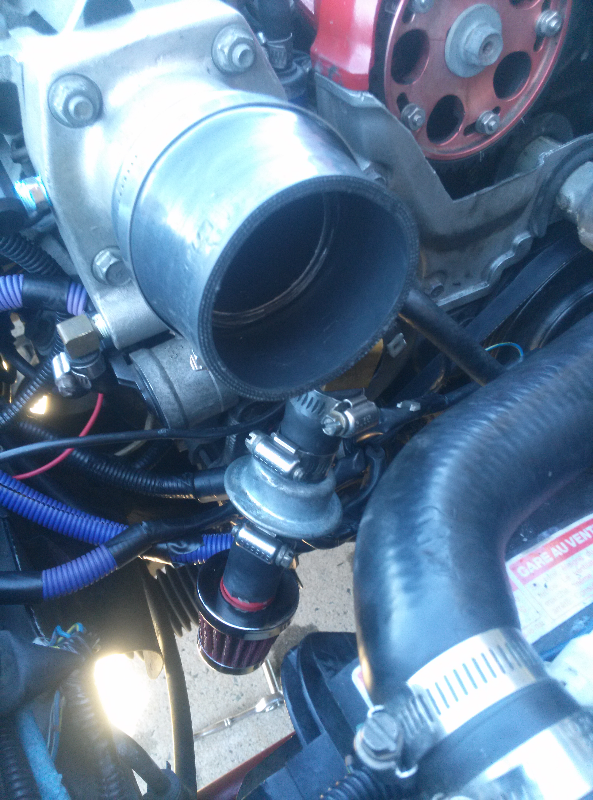 The dual throttle body solves the idle problems of the stock JRSC, and creates a bunch of new fun challenges. The solution posted earlier here screws the air flow meter up. Only if you're running the stock ECU & a piggyback/bandaids. True. Or more correctly, if you aren't running speed density or alpha-n. I'm in the process of prepping my 1.8 for mounting the M45 supercharger. New timing belt & waterpump. I was thinking about mounting the voodoo box for fuel management & MSD prior to doing the SC. What's the consensus? I would agree with the approach. You may even go one step further and do the fuel management first, timing second, SC third. That way you can hopefully isolate issues that pop up. I am not familiar with the voodoo, but if you are running tan tops at stock rail pressure on a 1.8, you will run over 80% duty cycle pretty quickly. You may want to run an aftermarket fuel pressure regulator and pressure gauge to boost your pressure. Definitely check the fuel pressure even with the stock regulator. You will certainly want wideband. Does your SC kit have any boost upgrades? Ha Brain, baby steps man. He will come around as the aspirations mature. Full standalone is intimidating at first. Do you have a wideband? What altitude are you at? If you were in Denver (like me) it is only a <20% increase in duty cycle. I would really recommend corky bell's book "supercharged" if you don't already have it. It will help you to understand the basics of fueling among other things. I have seen them used on Amazon for really cheap. It was the first book I bought when I got started, and I couldn't put it down. I'm located in pennsylvania, close to sea level. So you're suggesting I replace the tan top?get a aftermarket fuel pressure regulator and fuel pressure/air mix gage?